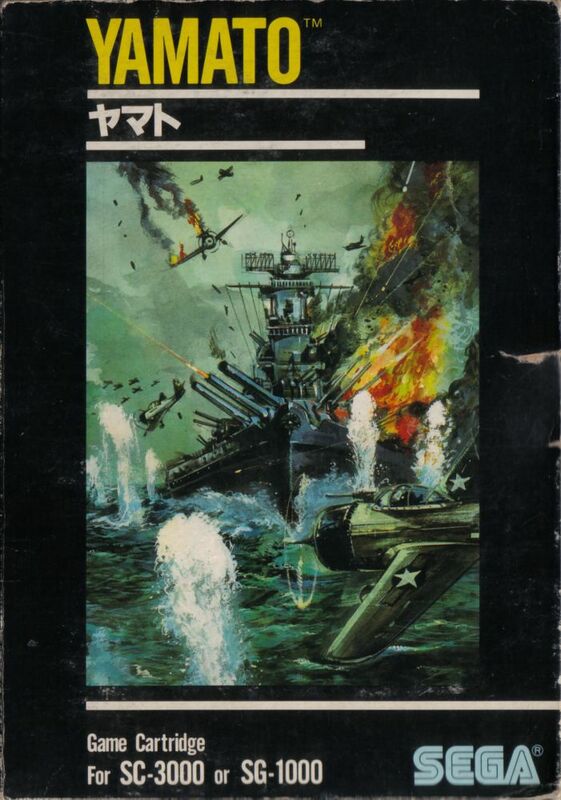 In Yamato, you control the WWII battleship Yamato and sink rows of slowly moving ships and planes with cannon blasts and bullets, respectively. Aim the two cursors in front of the battleship – a ‘+’ for bullets and an ‘X’ for cannon blasts – at whichever moving convoy you wish to explode and let ‘er rip. It might take a couple shots before a ship is turned into flaming wreckage, but you have unlimited ammunition for both attacks, so don’t hold back. The delicious peach sun sets atop an ocean of blood and metal. While taking down what I presume is the US military circa 1942-’44, dodge or destroy the missiles launched from the ships and planes. The battleship Yamato extends halfway out of the bottom of the screen and is able to glide effortlessly back and forth, despite the notable handicap of being a 50,000-ton battleship. 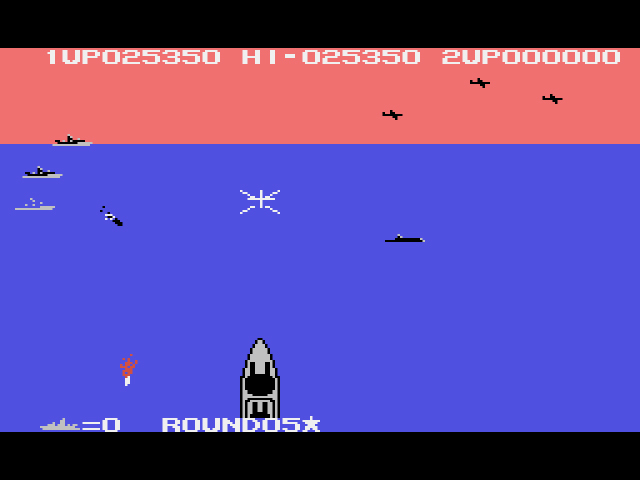 The more ships and planes you destroy, the more stars you accumulate at the bottom of the screen. Gather enough stars (anywhere between 15-20) and the level changes. The battle begins in the afternoon in level 1, rages on through dusk in level 2, then comes to a head in the dead of night in Level 3. 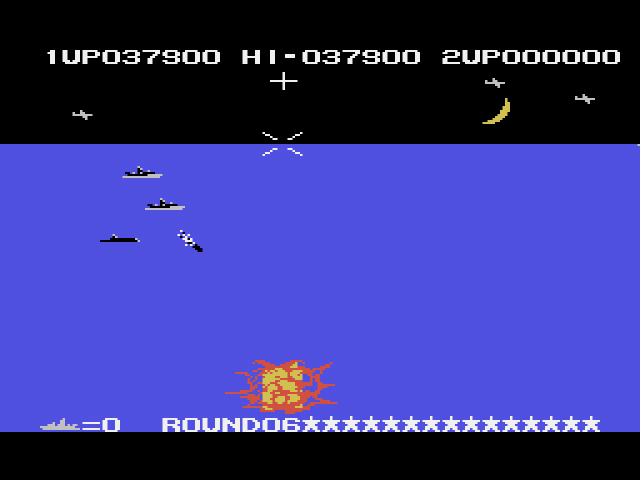 Make it past level 3 and the stages repeat, but the missiles drop quicker and the ships and planes sail and fly faster until you inevitably can’t fend them off anymore, just like the real battleship Yamato. Goodnight, sweet Yamato. We almost made it to Round 7. If Yamato sounds vaguely familiar, that’s because it’s the spiritual successor to a previous SG-1000 game, N-Sub. While N-Sub has you piloting a submarine and Yamato a battleship, both games take place in the ocean and ask you to blow up slowly moving rows of ships while dodging missiles launched from said ships. In N-Sub, however, there was no sense that you were progressing: no background changes, no difficulty increase, nothing except the same rows of ships repeated ad tedium. Yamato‘s faster gameplay coupled with a steady sense of progression (time changes between levels, faster missiles to avoid, etc.) is a huge improvement. That being said, both Yamato and N-Sub are shallow arcade ports that don’t entertain beyond a ten-minute window of time. There are better more addictive arcade titles out there. For the SG-1000, though, Yamato ain’t half-bad. Were you able to find the arcade version to compare? It seems like it’s kind of hard to track down. The arcade version is essentially the same with better graphics. Battleship Yamato moves slower (and more accurately methinks) in the arcade than on the SG-1000, but the SG-1000 Yamato is much more responsive, making for a more enjoyable experience. None of the games you’ve reviewed seem too appealing or interesting to me, but I have some fun reading these reviews. I’m interested in seeing what you have to say about some later games (like Flicky, that one has several ports from what I know, including one on the Sega Genesis), but I’ll keep reading what you post here. Also, I finally read every NES review you posted on Questicle! Yay! That was a huge time sink but it was really worthwhile. Yeah, these SG-1000 games have been a bit of a slog. I can see why no one’s devoted this much time and web space to them before. And thanks! I will continue to do my best. If no one has given too much dedication to the console and its games, then this site will likely become a great place if someone is looking for some reviews (and the occasional bit of information) on these games. Actually, I didn’t know of this console’s existence before. I always thought the Master System was Sega’s first home console (and I’m probably not the only one who thought the same). It was kinda weird when I saw this blog and found out the SG-1000 was their first console, so I’m interested in knowing more, whether it’s just from your game reviews or by looking up some other information on various sites. I had the same thoughts that these reviews are far more entertaining to read than the games are to play. Thanks for the post thedylanthe. P.s. Is pixel dude actually named Sam or is that based on nes game? His name is Sam, yup. And as far as I know, he’s ok with his name being out in the open now, unlike when we were doing the Pixel Dojo podcast. I played this quite recently on an emulator. I found it tricky to get to grips with regarding the two types of targeting cursor. After that it was straightforward and I enjoyed it. Great review.